Jen watched the planet’s surface grow large as she and Dimitri sped towards it, helmeted heads first, like two silver bullets. At least there was no atmosphere to worry about. The planet was dark, as if in night-time, though this was the side facing the system’s red dwarf star. As she tried to look closer, her helmet sensors registered the ocular effort and zoomed in via her visor. No distinguishing marks, a flat plain of gun metal grey dust, an ocean of iron filings. It was all that was left of the Level Eighteen species that had almost taken over the galaxy two million years earlier, a race of machines. The other inhabitants at the time had barely survived, but had finally put them down, leaving nothing but this tomb planet of disintegrated machines, ten kilometres deep with their ashes. It was a memento, a shrine, and above all, a warning. And now she and Dimitri were there to try and find a machine remnant, and wake it up. I totally love "The Eden Paradox", which I bought as ebook from OmniLit. Since I don't own a Kindle, I'd love to see a non-Kindle ebook-version of the complete Eden series. Will I have to buy the other books as paperback or is there a chance that there will be a non-Kindle ebook-version? Hi Thomas, glad you love The Eden Paradox, it was a labour of love for me to write it :-) Unfortunately my publisher of the second and third books favours Amazon, so Eden's Trial and Eden's Revenge are only available in kindle or via kindle apps eg on IPad etc. 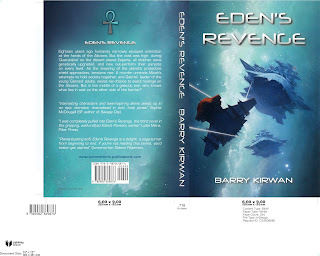 Eden's Trial is out in paperback via Amazon, and Eden's Revenge will also be in paperback in a few months. Hope you like them!